Drinking lots of water is a great habit, but throwing away disposable water bottles isn’t. People all over the world purchase a million plastic bottles every minute, and this imposes a severe threat to mother earth. In fact, according to research, over 38 million plastic bottles are used every day and only half of them are recycled. While, more than 16 million of them are either put to landfill, burnt, or they’re just left to pollute the environment, especially the oceans. This is the reason why it’s now best to have a reusable water bottle so you could just refill the water and you’re good to go. You won’t only keep your body hydrated; but you’ll also help save the world! However, with all the water bottles available today it’s hard to choose which one to buy. That’s why I searched for the best ones on the market today, and I will review each one for you. But before moving on to the five best water bottles of 2018, here are some important reminders that are worth keeping in mind. We all know that the recommended daily water consumption should be around 8-ounce glasses. The size of your water bottle depends on your daily tasks. If you’re often engaged in exhausting physical activities, you need to have a bigger water bottle to keep your body hydrated. You’ll need to drink around 4-6 ounces of water every 20 minutes so you must always have some water to bring along. Water bottles also come in different shapes. Some tall and slender water bottles can hold the same amount of water with those that are wide and short. If you intend to hold your water bottle while running, you should choose one that could fit your hands. While if you’re looking for a bottle to bring with you while hiking, you should pick one that’s large enough to keep you hydrated but slim enough to fit on the sleeve of your backpack. Plastic water bottles are the most preferred ones because they are lightweight and durable. When buying plastic water bottles, always choose those that don’t contain a chemical called bisphenol A (BPA), often seen as BPA-free. This type of chemical is said to leach in water and can even cause cancer and diabetes. Stainless steel water bottles are also a great option if you want to keep your cold drink cold and hot drink hot. However, stainless steel water bottles are usually heavier and scratch easier than plastic. Vacuum insulated water bottles are more expensive, but a lot of people are purchasing them because they can keep the water cold or hot almost throughout the day. This happens because the inner bottle is surrounded by a vacuum channel, which is a great method of insulation. With that said, since it has two chambers in one bottle, these tend to be heavier. Water from metal and plastic bottles tend to have a distinct taste when you drink, but you won’t face the same dilemma with glass water bottles. Although they are not great insulators, glass water bottles usually come with a silicone sleeve for protection as they are fragile. Plus, it’s nice to see when it’s time to refill the water inside the bottle. Collapsible water bottles are great if you have limited space inside your bag but you want to bring some water with you. It’s the lightest among all materials, and it’s the thinnest. This type of water bottle is great to bring with you when travelling or hiking. All water bottles are intended to keep you hydrated, but some of them offer an easier way to drink than others. Those with narrow mouths tend to be easier to use rather than wide mouths that can spill while you’re drinking. It’s also important to look at how tight the cap of the water is so you’re that the water inside is safe and secure. The SHO water bottle claims to keep your cold drinks stay cold for 24 hours and a hot drink for 12 hours, and this has been proven by a lot of people who have purchased the product. This ultimate vacuum insulated water bottle has indeed satisfied a lot of its customers with its performance. Put some cold water in the water bottle during the morning, and you can drink still the cold water in the evening. It’s 100% Leak Proof & BPA + Phthalate free which means it’s safe to be used by the whole family. Aside from that it also comes in 5 sizes and 8 different colours such as Very Berry, Midnight Blue, Aqua, and a lot more. 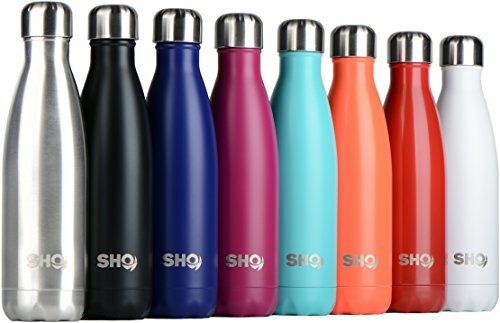 Just like the Sho water bottle, Chilly’s Bottles are also double-walled vacuum insulated that’s why they also keep your cold drinks chilled for 24 hours and hot drink warm for 12 hours. What I like about these bottles is that they come in a 100% recyclable and recycled packaging which colours match with that of the product. It’s airtight, leak-proof and it has a screw top lid. The mouth on this bottle doesn’t allow water to splash all over when you drink and it doesn’t also sweat so you can keep it with all the papers in your bag. The Chilly’s bottles come in a variety of colours, and my most favourite ones are Chrome Gold, Pastel Coral, Pastel Green, and Matte Black. This colourful plastic water bottle is great for your adults and kids. The CamelBak Chute Water Bottle claims to be durable, leakproof, and it provides a high flow of water without sloshing or spilling. Also, it’s 100% free of BPA, BPS and BPF, so you’re guaranteed it’s safe to be used by the whole family. If you intend to buy one for your son, he will surely like this Zzzap design. And if you want one for yourself, it’s available in plain colours such as Sea Glass, Lotus, and Sage. These stainless steel vacuum insulated water bottles are BPA-free, and their insulating capabilities for hot beverages depend on the size. All of them can keep your drink cold up to 14 hours, but 350ml water bottle keeps your drink hot up to 10 hours, 500ml up to 12 hours and 750ml up to 24 hours. Even if you put boiling water inside this water bottle, you won’t feel it because the double walls won’t allow the heat to pass through. They are all sweat-free and leakproof which makes them convenient to bring anywhere with you. 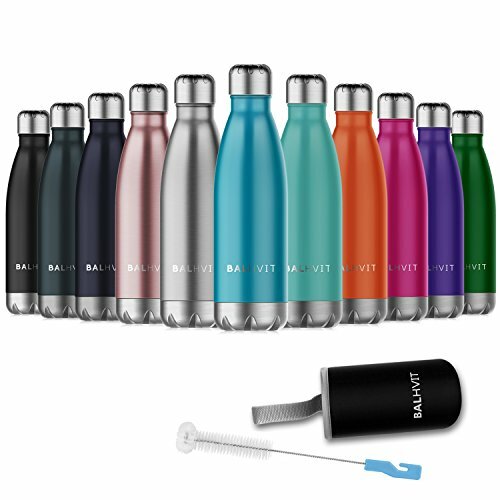 The Balhvit water bottle is available in 14 different attractive colours like Rose Gold, Mint Green, and Matte Black. These water bottles also come with a free brush for cleaning and cover for cycling, gym or yoga. What’s unique about these insulated stainless steel water bottles is that they come with two interchangeable caps. One is a sports cap that effortlessly allows you to drink from your bottle without removing the cap and the other is a loop cap that keeps the water secure inside the bottle so it doesn’t leak. 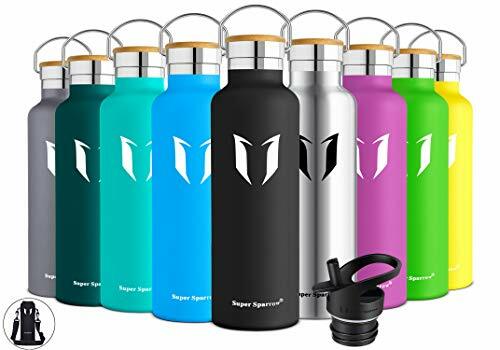 These Super Sparrow water bottles are made with premium, BPA-free, and powder-coated stainless steel, that means you won’t have to worry about the quality of the water you’ll be drinking. Just like other water bottles of the same material, it guarantees to keep your cold drinks cold for 24 hours and hot drinks hot for 12 hours. These water bottles come in 3 sizes and 12 interesting colours such as Apple Green, Lavender, Rose Red, and Lemon. Keep Yourself Hydrated With These Water Bottles! These water bottles aren’t only made to contain water. You can put hot coffee to keep you awake or cold fruit juices to help you stay refreshed. However, always remember to sustain your body with the recommended amount of daily water intake to remain healthy and keep your skin glowing!